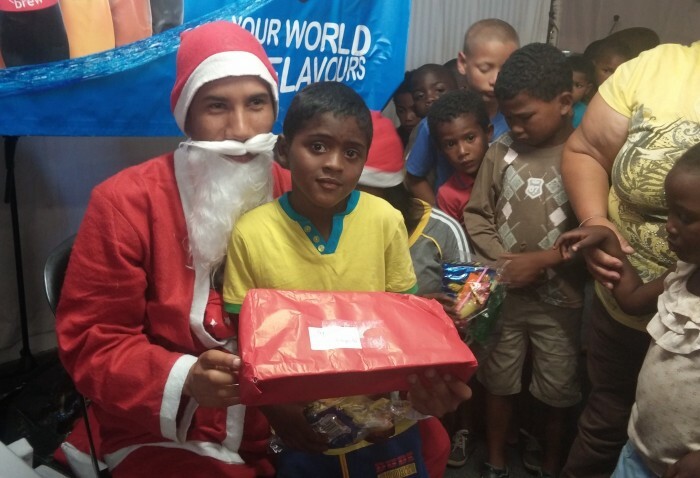 Vrygrond, Cape Town, South Africa November 11, 2015-Where Rainbows Meet, a constructive non-profit organisation in Vrygrond Cape Town, South Africa has started a crowdfunding campaign through Jumpstarter South Africa to help the impoverished children of the community this Christmas. Starting this November, the locally founded non-profit organisation Where Rainbows Meet has begun its Adopt a Child for Christmas Campaign, focusing on providing some of the world’s most victimized children with a real Christmas. The organisation would like to raise over ZAR 15,000.00 to fund the campaign this Christmas season. This event not only provides basic necessities to the children of the community, but also shows them that they are not forgotten, unloved, or condemned to a life of poverty. More than often, children in the community face abuse and neglect from their parents and extreme violence into their adult years. The campaign was first attempted in 2014 and was a resounding success with the project raising over ZAR 100,000.00, over 10 times the fundraising goal of ZAR 10,000.00. This success allowed the organization to provide not only food, clothes, and medicine to over 2,500 children, but also toys, hygiene materials, education materials, and even a safe and fun community event for the people to enjoy. This year, Where Rainbows Meet hopes to surpass last year with a bigger impact through this campaign in order to give back to its community in a unique fashion. The very active nature of the organization paired with its very real presence in the hearts and minds of the local community means that every donation will make a real difference in the lives of these children and will not be just another drop in the bucket. “I’m really excited to be part of this Adopt A Child for Christmas campaign. It will be interesting to see how far we can go with Jumpstarter, considering we can reach donors worldwide,” said Alicia McClintock, an international volunteer from the United States. Since 2008, Where Rainbows Meet has offered a wide variety of programmes to provide education, food, a legal outlet for crimes committed against members of its community, and a place to provide loving care to local children who are abused, neglected, and/or abandoned. Programmes for all members of the community include: Early Childhood Development, Youth Development, nutrition, computer and life skills training, organic gardening, and the Siyazenzela beading and sewing center. Everyone is welcome to attend the events on December 10th and 14th. For more information on Where Rainbows Meet, visit www.WhereRainbowsMeet.org. Author: Kyle Luke Cupido from Where Rainbows Meet. Images: For high res version/s of One image/s please contact Where Rainbows Meet.